Posts tagged "derecho a la vivienda"
La semana pasada la Comisión Nacional de los Mercados y la Competencia, hizo público un estudio por el que afirma que no existen evidencias de que los cambios de uso de alquiler residencial al turístico encarezcan la vivienda. Acto seguido , anunció que iba a recurrir ante los Tribunales las regulaciones de las viviendas de alquiler turístico aprobadas por los ayuntamientos de Madrid, San Sebastián y Bilbao. Cuando desde prácticamente todos los sectores se afirma que una parte de la responsabilidad de la burbuja de los alquileres viene dada por una baja oferta, afirmar como hace la CNMC, que los cambios de uso de residencial a turístico no influyen en los precios es absurdo. Con análisis simplistas, no ven la cadena de efectos que produce este cambio de uso, que expulsa a familias a la periferia, enfrentándose ahora a la subida de precios que les marcan los nuevos propietarios de viviendas, socimis y fondos buitre, a quienes la banca rescatada y Sareb ha regalado nuestras viviendas. Como bien ha acreditado la periodista de eldiario.es Marina Estévez, en un excelente artículo publicado en ese medio, la CNMC utiliza los mismos argumentos que el lobby de AirBnB ante Bruselas, pero leyendo dicho estudio podemos observar cómo no sólo utiliza sus argumentos, sino incluso las propias estadísticas de AirBnb. La CNMC ignora en su informe que la vivienda es bien al que todas tienen derecho, según el artículo 47 de la Constitución, que además, mandata a los poderes públicos a combatir la especulación, y establece además que la comunidad debe beneficiarse de las plusvalías que genere la acción urbanística de los entes públicos. Las desregulaciones, es decir, las eliminaciones de los controles gubernamentales a la banca, propiciaron la crisis de la que aún no hemos salido. Las Cajas de Ahorro desreguladas han terminado generando enormes deudas que los gobiernos han hecho pagar a la población y han terminado desapareciendo. Las empresas de la economía presuntamente colaborativa como Deliveroo, AirBnB, Cabify, Uber y otras, sólo traen más desregulación, fraude fiscal y en definitiva un capitalismo más salvaje aún que aumenta el empobrecimiento de los sectores que tocan, y a través de ellos, del conjunto de la población. La CNMC, nos tiene acostumbrados a multas, por ejemplo a las eléctricas, que hacen rentables algunos de sus fraudes, ya que únicamente rebajan un poco los beneficios obtenidos mediante prácticas fraudulentas. Su actuación en este caso, nos parece paradigmática de lo que es la defensa a ultranza de los dogmas neoliberales por encima de los derechos de la población. Además, camufla su defensa de los intereses de estas grandes multinacionales hablando de la defensa de la competencia y en favor de los “titulares de viviendas”, como si esta no hubiera muerto con el capitalismo financiero de finales del XIX, restringiéndose esta competencia entre las grandes concentraciones de empresas, que aterrizan agresivas para aprovecharse de las infraestructuras y los impuestos de la ciudadanía, convirtiendo los barrios en zonas de atracción y ocio que despachan a vecinas, para, con los beneficios, desviarlos a paraísos fiscales. Desde la PAH exigimos que aquéllos sectores de los que depende el cumplimiento de los Derechos Humanos, como lo es la Vivienda, salgan del campo de acción de los organismos que como la CNMC, anteponen los intereses de muy pocos a los Derechos de la mayoría. Exigimos al Gobierno del Presidente Sánchez la adopción de medidas urgentes y de transformación social para garantizar el derecho a la vivienda. La PAH ha ofrecido a todos los partidos la Ley de Vivienda de la PAH con soluciones reales a los problemas, recogiendo las aportaciones de las Leyes de viviendas de las Comunidades Autónomas -momento para retirar los recursos de inconstitucionalidad- y en consonancia con las demandas que las Naciones Unidas ha hecho al gobierno del Estado. Social collectives, institutions and international voices are aligned in favor of the debate and enactment of PAH’s Housing Law. Only the Popular Party (PP) and Ciudadanos would support a government veto against this law proposal. Last January 10th, families organized within the Platform for People Affected by Mortgages (PAH by its Spanish acronym) registered PAH’s Housing Law in the Spanish Congress. Should it be passed, this law proposal would end evictions and energy poverty, as well as regulate rental contracts. This proposal is the result of three years of collective work, where affected families from 240 platforms throughout Spain agreed on the draft for a legal text. During the following year the initial text was negotiated with all Spanish MP’s, with the intention to generate a consensus proposal to kickstart a democratic debate among all forces of Congress. The measures resulting from this process were: dation in payment, regulation of rental prices, a moratorium of evictions, an increase of public housing stock and guaranteed access to electricity, water and heating. All common sense measures which are a reality in the rest of the European Union. However, during this process we found out that the PP-led government has the capacity to veto law proposals affecting the national budget for the current tax year. Faced with this, we included a clause so that any measure needing public expenses would not be enforced until the next national budget were approved. – Hundreds of social collectives, grassroot unions, neighbourhood associations and social movements which have taken part in demonstrations organized in Spain’s provincial capitals. 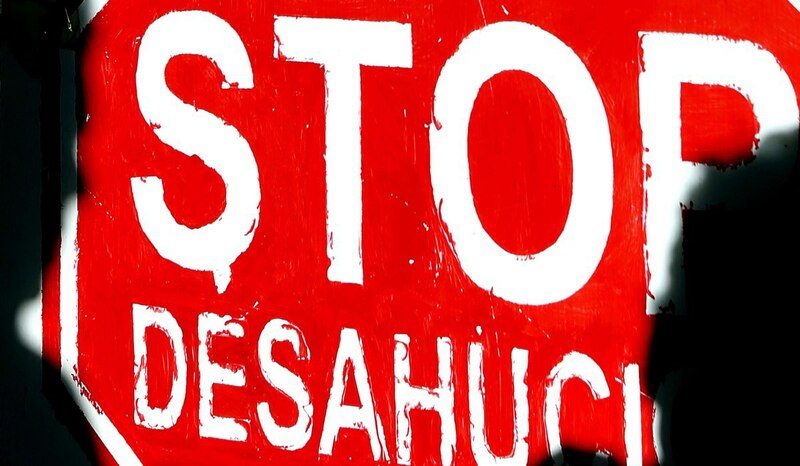 The last one took place in Madrid on March 3rd, where families coming from all over Spain came to the country’s capital city to demand the debate and enactment of PAH’s Housing Law. 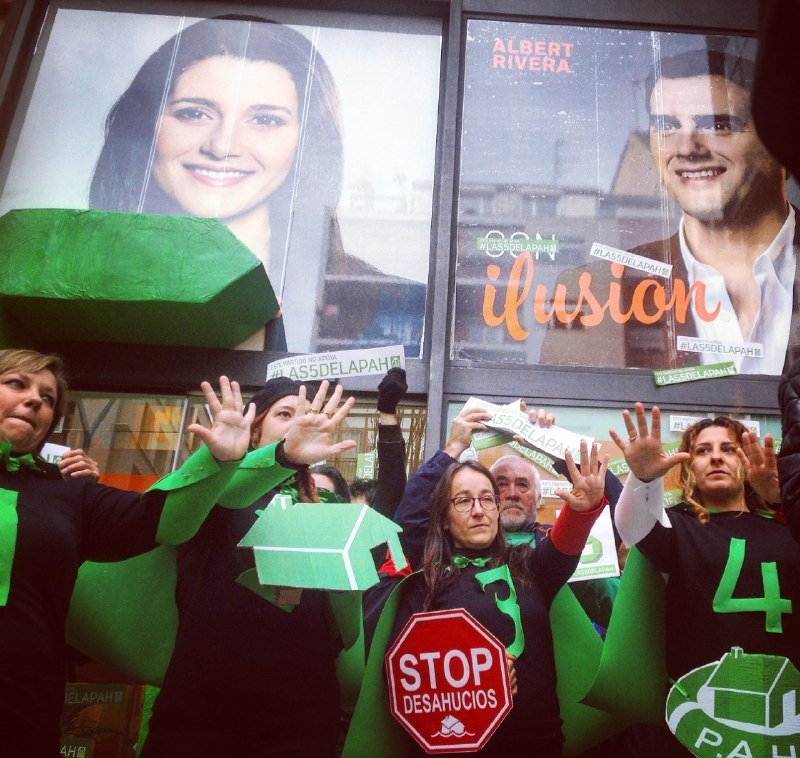 – Social movements from London, Berlin, Munich, Paris, Bucharest, Milan, Cyprus, Sarajevo and Lisbon have staged protest actions in front of Spanish embassies demanding that the government accepts PAH’s Housing Law for consideration. These demonstrations have been coordinated by the European Action Coalition for the Right to Housing and to the City, the Marea Granate (a collective of Spanish migrants abroad) and the Rosa Luxembourg Foundation. – With the slogan #EstaEsMiLey (#ThisIsMyLaw) we have received up to 40 supporting videos from journalists, musicians, artists, television presenters, actors and actresses and citizens’ collectives. Some examples would be Jordi Évole, Rozalen, Àngel Llàcer, Oxfam and the Kellys from Barcelona. – Over a hundred City Halls have signed motions supporting the legislation of our suggested measures. – Political parties of up to 14 Autonomic Parliaments (out of a total of 17) have signed documents of public support asking for this law to be accepted for consideration in Parliament. The Autonomic Parliament of Navarra even made a public statement of institutional support. – In the Spanish Congress we have received support from the following political parties: Podemos, ERC (Catalan Republican Left), Compromís and EH Bildu. And even though they did not take part in the law’s registration process, both PSOE (Spanish Socialist Workers’ Party) and PDeCat (Catalan Democratic Party) have publicly supported the processing of our law. 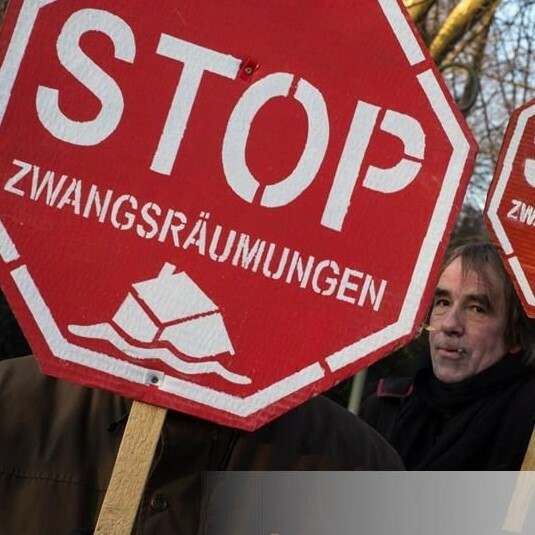 – Recently, in the European Parliament, we received signatures of support from two Eurogroups in full: GUE/NGL (Gauche Unitaire Européenne / Nordic Green Left) and the EFA (European Free Alliance), who altogether represent 55 political parties from different European Union countries. – We have even garnered support repeatedly from the United Nations. As of today, the UN has ruled twice that in Spain human rights are violated when evictions without a housing alternative are carried out. UN Special Rapporteur on Housing, Leilani Farha, authored an article stating that the solution to these issues was PAH’s Housing Law. She went as far as describing PAH’s Housing Law as an example to inspire the world. As if that were not enough, we would like to repeat that PAH’s Housing Law incorporates the demands of a Popular Legislative Initiative that we registered in 2013 in the Spanish Congress and which received 90% of public support from Spanish society. 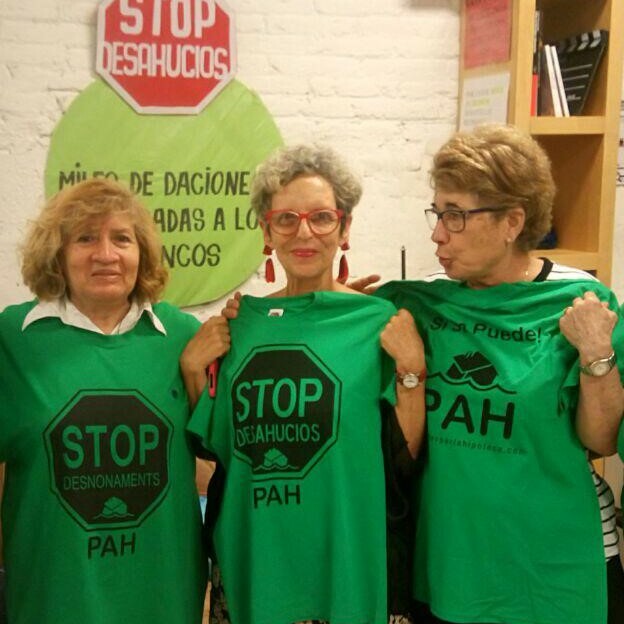 Spanish civil society stands behind PAH’s Housing Law. Social organizations stand behind PAH’s Housing Law. And institutions on all levels demand that this law be debated and enacted. Even voices from the international community have described PAH’s Housing Law as a world referent. In 40 years of democracy it is a historical precedent that a law proposal receives such massive and widespread support. The only ones in favor of a government veto which would prevent this law being debated would be the Popular Party and Ciudadanos. 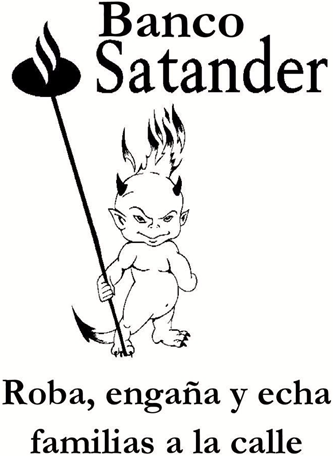 The parties led by Mariano Rajoy and Albert Rivera. Faced with this situation, our message is clear: allow democracy to work. Allow a law written by and for the citizens to be debated. Tomorrow, Friday the 16th of March, will be the last day when the government can register a veto, which would be unjustified. The government has the chance to position itself alongside all the voices that defend PAH’s Housing Law. And should they miss out on this opportunity, Ciudadanos can still reconsider their stance and join that overwhelming majority defending families’ rights. It is simply a question of political will. ¡Sí se puede! We can do it! 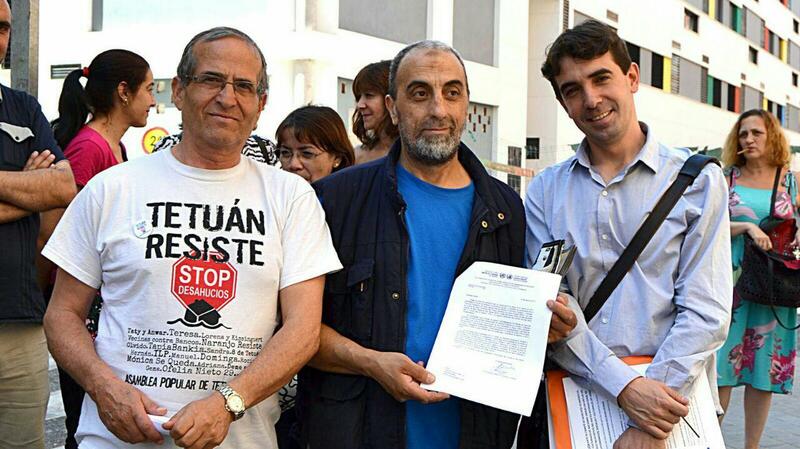 The support for the PAH Housing Law and the fight for a dignified housing does not end in Spain. 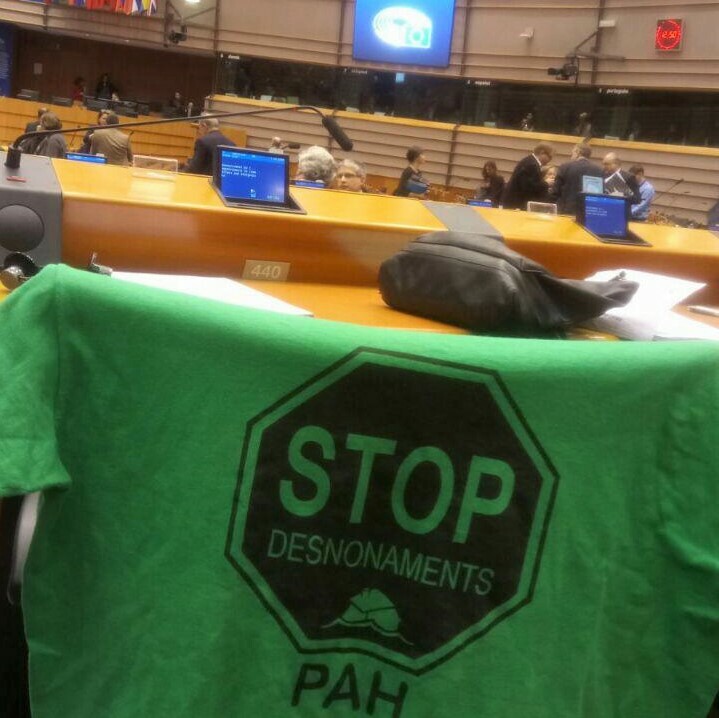 On the 27th and 28th of febrary, the PAH with representation from all the territories, traveled to Brussels to take our demands to the European Parliaments, with the exception of the PP who refused to help us.The reception of our demands was practically unanimous both for the spanish representations, even the Ciudadanos,as recognized that there was no point in vetoing the discussion. as well as on the part of the majority of the members of the European Parliaments from the rest of the European caountries. We also met with social movements from countries such as Greece and Brussels where we received a warm welcome that ended with a unanimous statement: “We need the PAH Housing Law in ours countries” A statement that only reaffirms the words of the UN Housing Rapporteur, affirming that this Law was a precedent that serves to inspire the world. All this is another example of the loneliness of the PP, protected only by Ciudadanos. If we do not overcome the veto, which has a deadline of March 16, we would face an absolute violation of Spanish democracy and a greater evidence of the lack of political height of those who claim to represent the families of this country, but only They worry about the economic interests of a few without taking into account the most fundamental rights and the lives that are at stake due to the violation of these. Yesterday we showed it in . We have shown that if they do not sit down to talk, we will rise up and occupy the streets to achieve with mobilization and civil pressure to carry out what the government is not capable of doing. Thanks to all who have joined us in this international show of support for our proposal for the Housing Law. Your support has been key in reminding us that we are not doing this alone. It has been a very successful call and we can not thank enough for the help to promote a fairer legal system in Spain. Changing the housing policy of our country would mean a gigantic victory for our movement and a social welfare for all citizens. Ante el Dictamen de Naciones Unidas sobre desahucio de alquiler en España. No toleramos ni un desahucio más. Ayer conocimos que el Comité de Derechos Económicos, Sociales y Culturales (DESC) de Naciones Unidas ha declarado que el desalojo sin alternativa habitacional de personas en procedimientos de alquiler, bajo su actual regulación, constituye una violación del Derecho Humano a una Vivienda Adecuada. El Comité juzgaba un caso de desahucio por extinción de contrato de alquiler de habitación, ocurrido en 2013 en el barrio de Tetuán de Madrid, que terminó con una familia con cuatro miembros durmiendo en un coche. Ni los Servicios Sociales municipales, ni el Instituto de la Vivienda de la Comunidad de Madrid (IVIMA) ., ni el propio Juzgado, impidieron el desahucio ni tampoco proveyeron de una vivienda para una unidad familiares con dos niños de 1 y 3 años de edad. En sus conclusiones, Naciones Unidas declara producida una violación por parte del Estado, ordena la reparación del daño causado a la familia e insta al Gobierno a remitir un plan de reforma profundo en materia de alquiler y vivienda en un plazo de 6 meses pues aprecia una situación de violación estructural. Podéis consultar la decisión en este enlace. Las conclusiones de Naciones Unidas apuntan a responsabilidades estatales con implicaciones para todos sus estamentos, desde los servicios sociales municipales, incapaces de atender algo tan básico como el techo de una familia, hasta el Congreso de los Diputados, responsable de una legislación procesal que convierte las sedes judiciales en oficinas de gestión del mercado de vivienda sin que los jueces puedan tomar siquiera en consideración la situación en que quedan las personas que van a ser desalojadas. Como hemos denunciado ante miles de desahucios desde 2009, en España se produce una violación estructural del Derecho a la Vivienda reconocido en la Declaración de Derechos Humanos y la propia Constitución de 1978, con daños sociales irreparables en los sectores más vulnerables. Este panorama dantesco de emergencia social ha llevado a la PAH y al movimiento por la vivienda a organizarse para detener miles de desalojos forzosos y recuperar miles de viviendas vacías de entidades financieras para convertirlas en hogares. Haciendo este camino hemos comprobado que la lucha por el Derecho a la Vivienda pone en relación los derechos de hipotecados, endeudados, desahuciados, alquilados, precarios, ocupantes sin título, habitantes de autoconstrucciones, personas sin techo, uniéndonos a todas frente a los abusos de un mercado de vivienda despiadado. En este sentido, la victoria de la familia madrileña que ha denunciado al Estado y conseguido su condena, es también una victoria de todo el movimiento, que nos reafirma en nuestras razones y convierte en más necesarias que nunca las campañas de desobediencia civil (Stop Desahucios, Obra Social PAH) y las propuestas de cambio (ILPs autonómicas, Ley de Vivienda Estatal de la PAH). A partir de septiembre se tiene que discutir en el Congreso nuestra propuesta de Ley de Vivienda que incluye varias de las recomendaciones de Naciones Unidas. En ese marco, desde la PAH exigiremos a todos los diputados que se posicionen respecto del cumplimiento de Derechos Humanos en materia de vivienda como hemos reclamado cada día en las calles. ¡No soportamos más violaciones de Derechos Humanos! ¡No toleramos ni un desahucio más! Plataforma de Afectados por la Hipoteca, 6 de julio de 2017. Naciones Unidas señala como especialmente sangrante la inacción de las autoridades autonómicas madrileñas que alegaron no disponer de viviendas suficientes para proteger a esta familia ( y a otras miles de familias desahuciadas en Madrid), cuándo al mismo tiempo se vendía el parque de vivienda pública a fondos buitre de capital internacional. Ver dictamen, párrafo 17. El Gobierno de España, a través de su representación ante Naciones Unidas, había alegado que los casos de alquiler entre particulares son una cuestión ajena a la responsabilidad del Estado, que no puede interferir en asuntos “privados”. También negó cualquier tipo de vulneración, llegando a afirmar que el mercado de alquiler no está sometido a las normas internacionales de Derechos Humanos. El pasado viernes 9 de junio, Raquel Rolnik, antigua relatora de vivienda de la ONU, aprovecho su presencia en Barcelona, para visitar a la PAH y conocer nuestras propuestas para garantizar el Derecho a la Vivienda de todas, grabando un video dónde daba su apoyo a la campaña de la Ley de Vivienda de la PAH: con la que pretendemos cambiar las leyes de vivienda frenando los desahucios y los cortes de suministros. La Ley Vivienda PAH es la actual campaña a nivel estatal de la Plataforma de Afectados por la Hipoteca, que arrancó el pasado 22 de marzo de 2017 con la presentación pública de nuestras 5 propuestas de mínimos por el derecho a la vivienda : dación en pago retroactiva, regulación del alquiler, moratoria de los desahucios, creación de un parque público de vivienda y garantizar los suministros básicos. Ante la falta de medidas eficaces, sentábamos así unas bases sólidas, ante la emergencia habitacional que vivimos, para garantizar el Derecho real a una vivienda digna para todas las familias, a quienes damos voz una vez más remarcando la urgencia a legislar nuestro texto de ley. Raquel Rolnik, fue durante seis años relatora especial de la ONU para el Derecho a la Vivienda digna. Mientras ejercía este cargo ya mostró su apoyo a la ILP Hipotecaria que presentamos en el Congreso en 2013, que fue bloqueada por el PP y su mayoría absoluta, a pesar de contar con casi un millón y medio de firmas, conseguidas a pie de calle, junto con y el apoyo de todos los grupos parlamentarios excepto el PP. Cuatro años después, Rolnik vuelve a dar su apoyo a las demandas y propuestas de ley de la PAH: Una iniciativa que forma parte de la lucha global por el Derecho a la Vivienda, avisando a los Estados de todo el mundo, que tienen que responsabilizarse de legislar leyes para frenar a los actores financieros que convierten la vivienda en una mercancía dejando sin hogar a millones de familias en todo el mundo. Llevamos 8 años denunciando las distintas mafia, tanto la bancaria como la política y hoy suscribimos como nuestras las palabras de Raquel Rolnik en el siguiente video: estamos hablando de un Derecho Humano básico, el Derecho a vivienda digna. La vivienda ha sido colonizada, tomada por el interés financiero y la gente se queda sin casa y sin acceso. Ahora es el momento de regular, de reformar, un paradigma que ha sido, no solamente en España, un fracaso en todo el mundo. Mientras haya vidas en juego, desde la PAH seguiremos luchando, cada día ,hasta lograr que nadie se quede sin hogar a causa de esta estafa mal llamada crisis. Tenemos las herramientas, solo queda legislarlas. Sabemos que tenemos la razón de nuestro y voces valientes como la de Raquel Rolnik, nos alimentan de fuerza para seguir tan convencidas como el primer día. Ayer llevamos las 5 de la PAH a las sedes de los partidos políticos que no se comprometen a poner fin a los desahucios, las deudas de por vida y a las viviendas vacías. Tanto Ciudadanos como PSOE y PP siguen sin comprometerse con estas demandas de mínimos. Ante unas elecciones que configurarán el gobierno de la siguiente legislatura, es inaceptable que la respuesta de Ciudadanos, al más puro estilo del PP, sea criminalizar a las familias que han hecho valer sus derechos durante los últimos 7 años. Ciudadanos lo que debería hacer es afrontar el debate y explicar porque su programa electoral no incluye las 5 de la PAH: medidas de mínimos para dar una segunda oportunidad a las familias, para garantizar un techo y suministros, y para acabar con los privilegios de la banca apostando por la protección de derechos de la ciudadanía. El objetivo de la campaña Las 5 de la PAH es llegar a la gente. Es fácil de deducirlo cuando te encuentras a gente de todas las edades con sus camisetas verdes, cargados con flyers y sus números cincos gigantes hechos de cartón y pintados a mano. Solo somos miles de familias defendiendo nuestro derecho a la vivienda. Si quisiéramos entrar en las sedes o actos electorales, lo haríamos sin un número cinco de 3 metros de altura que no entra por ninguna puerta. A estas alturas ya nadie cree que cinco supeheroínas de la PAH, cincos de cartones gigantes y flyers informativos sean violencia. No somos tontas. Y cuando ayer dábamos información la recibía agradecida y se unían a nuestras reivindicaciones. Esto no es una democracia de patio de colegio, somos adultas y sabemos que desde la PAH hemos intentado todo y demostrado nuestro compromiso, luchando cada día y en todos los espacios que se nos permite por el derecho a la vivienda de todas. La verdad es que, al final, tanto PP, como Ciudadanos, como PSOE no han respondido porque no incluyen esas 5 demandas urgentes y de mínimos que tanto necesitamos ¿No será que, además de eludir responder, hay algunos interesados muy poderosos que no se muestran que no quieren que se hable de desahucios, de dación en pago retroactiva y de dar una función social a las viviendas vacías? ¿O de acabar con los cortes de agua, luz y gas de las familias sin recursos? ¿Es esta la campaña electoral de los bancos o de Endesa? Pase lo que pase el 20D, ganen unos u otros, estén en el Gobierno o en la oposición, a partir del 21D seguirá nuestra presión a todos los partidos hasta que consigamos que el Congreso de los Diputados haga realidad #Las5DeLaPAH. ¡Dicen que no caben pero las vamos a meter! ¡Sí Se Puede! Las 5 de la PAH entran en acción: dicen que no caben, pero las vamos a meter! El pasado jueves 3 de diciembre empezó la campaña electoral a las elecciones generales del 20D. La Plataforma de Afectados por la Hipoteca (PAH) lanzo su campaña propia para marcar la carrera electoral el pasado mes de septiembre. En dos semanas hay elecciones generales y después de 6 años de lucha, tenemos la oportunidad de hacer valer nuestra fuerza y la solidaridad de la mayoría de la ciudadanía para garantizar, de una vez por todas, el derecho a la vivienda en España. Llego la hora de la verdad. 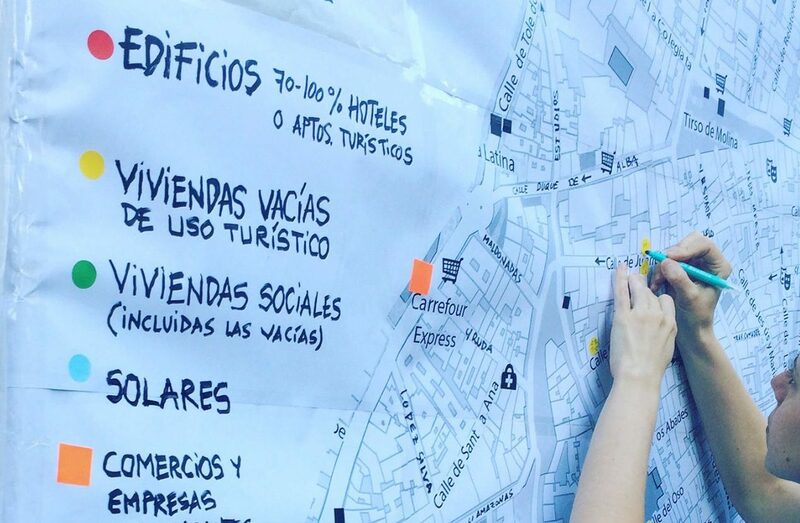 Por este motivo hoy lanzamos la última fase de esta campaña: la de salir a la calle ¡Que se nos vea y que nos oigan! 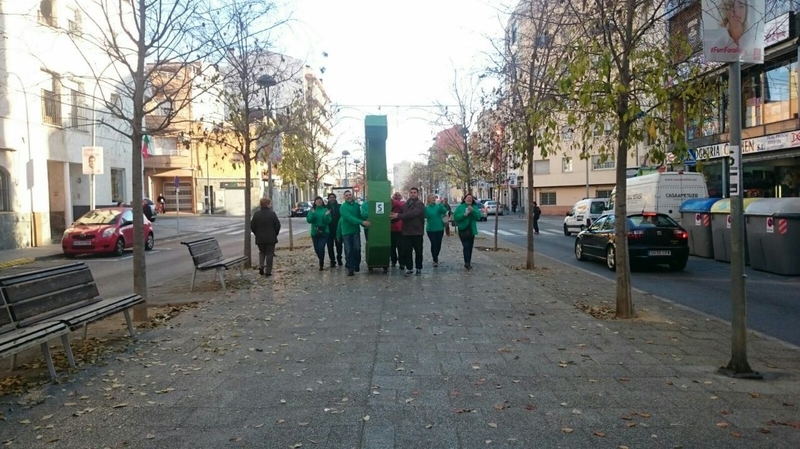 Con la campaña “Las 5 de la PAH” queremos ganar definitivamente las demandas que hicieron nacer a la PAH y que el PP bloqueo en el Congreso en 2013 rechazando nuestra ILP. A ello hay que sumarle la fuerza y las ganas de más 6 años de lucha con el apoyo mayoritario de la sociedad y repletas de pequeñas grandes victorias, y la demostración viva de que “si se quiere, se pueden cambiar las leyes”, lo que significó la aprobación de la ILP en Catalunya, la actual ley 24/2015, el pasado julio. Estas 5 demandas de mínimos, son las que planteamos a los partidos políticos desde el primer momento, exigiéndoles un posicionamiento claro sobre “las 5 de la PAH” y qué medidas plantean en su programa para abordarlas. Tanto Podemos como IU nos comunicaron que se encontraban en sintonía con las cinco exigencias, que a día de hoy recogen en sus programas electorales: seguiremos atentas para que lo cumplan a rajatabla. · El Partido Popular, servil como siempre a la banca y las suministradoras, ni nos respondió. Su única reacción pública a nuestras demandas han sido las ejecuciones hipotecarias y desahucios de los últimos años, y su negativa constante a cambiar las leyes, bloqueando la ILP estatal y tratando de tumbar la Ley 24/2015 por supuesta inconstitucionalidad. · Ciudadanos se posiciono tajantemente en contra de la retroactividad de la dación en pago, lo que supone dejar a 400.000 familias que ya han sido desahuciadas desde 2009 con deudas impagables de por vida. Y por si fuera poco, la única medida que plantea el partido para ampliar el parque público de vivienda es la compra de inmuebles a la banca, es decir, continúan con la lógica del PP y PSOE de seguir regalando dinero público a la banca. · PSOE, el del rescate bancario y la agilización de los desahucios, solo asume una de las demandas: la dación en pago retroactiva. En el resto de puntos tiene una postura como Ciudadanos o PP, es decir, que la vivienda vacía, pagada con dinero público por el rescate bancario, siga siendo objeto de especulación y en ningún momento apuestan por movilizarla para que cumpla su función social. El Partido Popular, Ciudadanos y PSOE coinciden en su base: ninguno de los tres partidos se atreve a co-responsabilizar a la banca y las suministradoras para poner sus recursos y paliar la emergencia habitacional. Su único objetivo, de nuevo, es gobernar para los mismos actores del IBEX35, responsables de la burbuja inmobiliaria y la crisis que arrastramos hoy. Partido Popular, Ciudadanos y PSOE son los partidos de los desahucios, las deudas impagables y la vivienda vacía, son los partidos que mantienen los privilegios de la banca y las suministradoras en detrimento de los derechos de la ciudadanía. Frente a su negativa, tenemos preparada una batería de acciones hasta el 20D para informar al resto de la ciudadanía y señalizar a los partidos que no apoyan #Las5DeLaPAH. No vamos a dejar que queden en papel mojado nuestras demandas. O cambian su posición o vamos a pedir a la ciudadanía que los penalice no votándolos. La actual situación política puede hace temblar la mayoría absoluta del Partido Popular y las aspiraciones de un PSOE y Ciudadanos que no se comprometen con los derechos fundamentales. 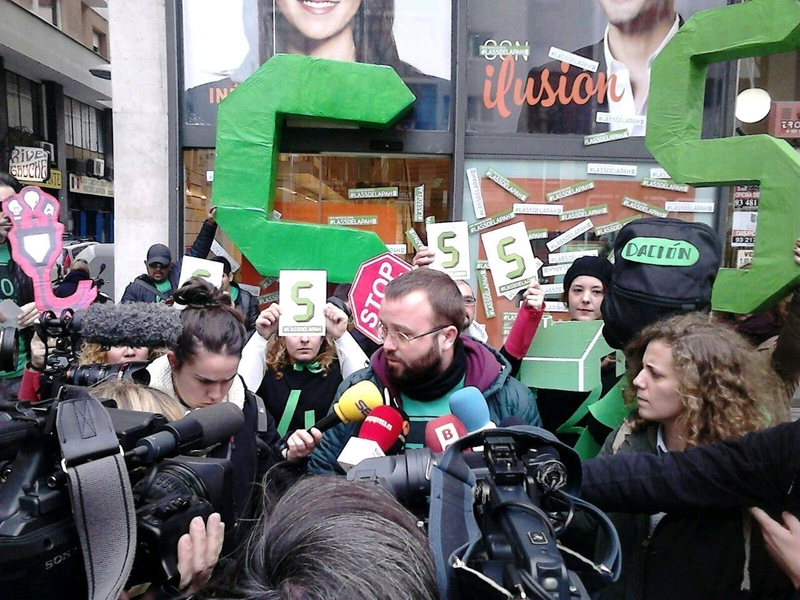 Es nuestra oportunidad para exigir #Las5DeLaPAH y que con el próximo Gobierno se legisle de una vez por todas una ley de medidas urgentes para afrontar la emergencia en el ámbito de la vivienda y la pobreza energética en el estado Español, porque solo falta voluntad política para que sea real. En Catalunya ha sido posible y ahora la queremos para todo el resto del estado. Porque hay vidas en juego y los derechos de todas son innegociables. Dicen que la campaña electoral es para escuchar y dar argumentos. Dicen que la jornada de reflexión, es el día de la ciudadanía, es el día de la democracia, el momento para decidir. Nuestro lugar como ciudadanía organizada, está en la movilización: demostrando que hemos perdido el miedo ante gobiernos secuestrados por los intereses de la banca y las suministradoras. 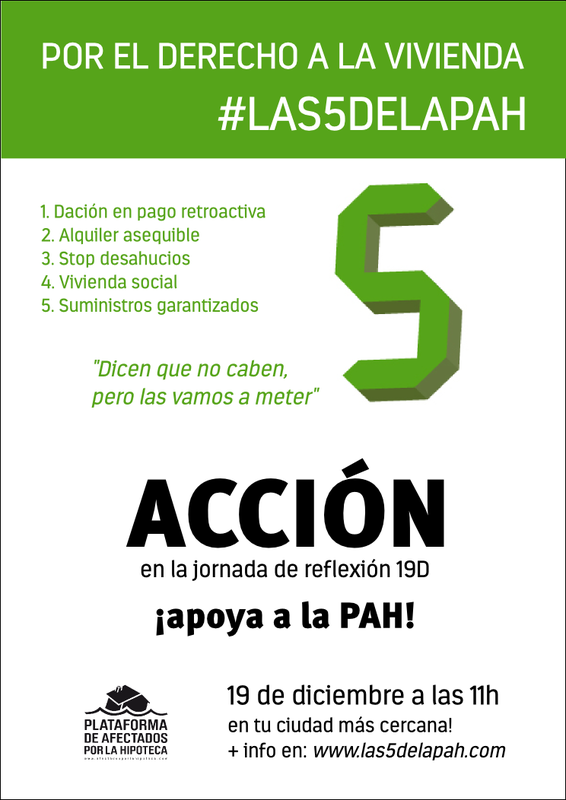 Como en el 15M de 2011, la campaña y la jornada de reflexión, será el día de todas y de las cinco demandas de la PAH, las cinco de todas. Nos vemos para reclamar lo que es nuestro! Así que toma nota y participa con la PAH más cercana en tu localidad! Del 9 al 18 de Diciembre las PAHs de todo el estado salimos a las calles a informar a la ciudadanía sobre #Las5delaPah y los partidos que no las apoyan. Explicaremos al PP, PSOE y C’s que aunque digan que no caben las 5 demandas de mínimos de la PAH en sus programas, las vamos a meter. Ayúdanos a informar! El 19 de Diciembre a las 11h, en plena jornada de reflexión, en diferentes ciudades de todo el estado realizaremos una acción sorpresa en la que toda la ciudadanía está invitada a participar. Iremos informando de las diferentes convocatorias.